Witchfest is always a highlight of the year for me, and I am very lucky that I live within easy public transport travel of the annual witchcraft convention run by Children of Artemis in south London. 1) Meeting up with so many friends: Everywhere I went I bumped into people I knew. Some were friends I knew were going and who I had planned to meet up with, others were people I hadn't seen for ages. Everyone looked happy and seemed to be having a great time. 2) Talks: Witchfest always has a great range of speakers talking on a huge variety of witchcraft-related subjects. I heard Melissa Harrington talk on Wicca and Sexuality, Vivianne and Chris Crowley give an illustrated lecture on Cauldron, Grail and Sacred Quest, and Prof. Ronald Hutton talk about The Ancient Mysteries. 3) Workshops: There were several workshops running throughout the day, including didgeridoos playing and wand making. I went to Jane Meredith's workshop on Aphrodite's Temple, which included a lovely guided meditation to see the mirrors of Aphrodite. 5) Shopping at the market stalls: Witchfest has a whole hall set aside for a traders selling all manner of witchy wares from clothes to candles and books to broomsticks. 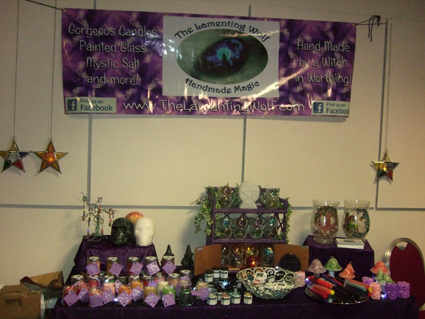 The photo at the bottom shows The Lamenting Wolf, a stall selling handmade items including amazing candles. You can visit the Lamenting Wolf website at http://www.thelamentingwolf.com/ or call 07947 173110. 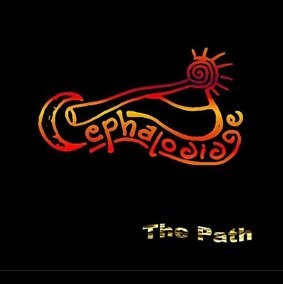 6) Entertainment: I was delighted to hear Cephalodidge live, as their album The Path is one I've enjoyed for a while. 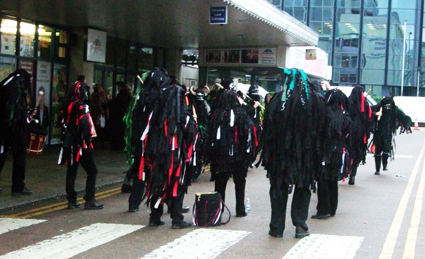 Other entertainment included the Wild Hunt Border Morris (pictured above), Damh the Bard, Kitty Hudson, The Dolmen and Pythia. There was also late night dancing in the bar. 7) The mead: There was a lot of mead going around, with various brands on sale at the bar and in the market. And I drank quite a bit of it too, in great company. 8) Making new friends: Witchfest is always a great place to meet new people. More folks to hug and greet next year! 9) Value for money: The organisers point out that Witchfest is pretty cheap as festivals and conferences go. Tickets were £16 for CoA members and £24 for non-members, which included entry to all the talks and workshops as well as to the evening entertainment. All you need to pay for on top of the ticket price is your food, drink and travel - oh and anything you buy in the market of course. 10) Location: I know plenty of people travel a long way to get to Witchfest, at Fairfield Halls in Croydon, but I only had to hop on a bus. Brilliant! Sounds fantastic! Loving number four!